lt;stronggt;ICE64113lt;/stronggt;lt;BR/gt;Iceberg Rough N Ready Series Original Stackable Chairlt;BR/gt;Ergonomically designed for comfort with an extra-wide seat and back. Blow molded, high-density polyethylene is dent- and scratch-resistant. Heavy-gauge, powder-coated steel tube frame. Non-mar feet protect floor. Stacks up to 12 high. Recommended Applications: Breakroom amp;amp; Hospitality Seat/Back Color: Platinum Arms Included: No Overall Width Maximum: 17 1/2amp;quot;.lt;BR/gt;lt;BR/gt;lt;stronggt;RCP295600BKlt;/stronggt;lt;BR/gt;Iceberg Rough N Ready Series Original Stackable Chairlt;BR/gt;Lightweight containers are easy to handle and fit in well in many home and work environments. Rolled rims add durability and are a breeze to clean. All-plastic construction won't chip, rust or dent. Optional lids sold separately. 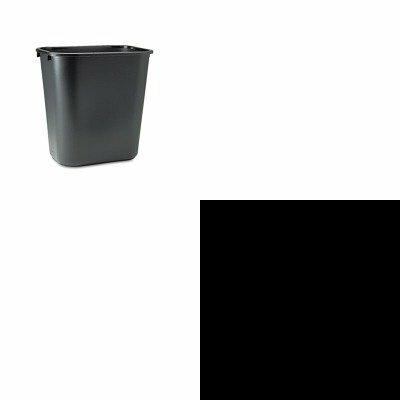 Waste Receptacle Type: Wastebaskets Materials: Plastic Application: General Waste Capacity Volume: 7 gal.